The original and best!, or is it like Marmite, love it or loath it? Made by Valley it is 523cm long, 50.5cm wide, 29cm high with a very low rear deck. The 'thousand years of evolution' it is said to encapsulate may be manufacturer hype, but it is based on a genuine West Greenland skin on frame boat brought back in the 1960s. Dimensions slightly increased to fit the European body frame. This was the first production model sea kayak, the earliest leaving the mould in 1972. Anas acutas come in many guises, starting off without hatches or bulkheads or deck fittings, followed by gradual evolution of the deck fittings and the introduction of a skeg. However, the form of the hull and deck has not changed except for a straightening out of the original crooked tail. Crooked tail boats from the first mould are now collectors items. Still in production after 40 years, despite competition with hundreds of more recent designs; it must have some good characteristics! Even after paddling one for years and having tried many other boats, I am unable to define why it feels so good. Maybe it is its playful nature, always up for rough water or threading between the rocks, even if you don't feel so confident yourself. Speed; with the relatively short water line, the theoretical maximum hull speed is less than many 18' boats, however it is narrow and easy to paddle. You will be able to keep up, but may not win races on flat water, once the waves get up it is another matter. Loads of rocker; this is the original banana shaped boat, meaning it is the fastest turning most manoeuvrable sea kayak, bar none. This is just the thing for close quarters work amongst the rocks, finding a way though a bad sea, surfing, or just showing off. It also results in a low centre of gravity, you are sitting down deep in the waves, so you feel very stable. Tracking; this is to some extent the converse of manoeuvrability; however, the boat goes well in a straight line and responds quickly to slight edging if tracking out of line. Older boats without a skeg had a tendency to weathercock, the current boats can be accurately set to follow any course by fine adjustment of the skeg. Some modern designs are difficult to turn into the wind in F5 upwards, a safety concern, not so the Anas, lift the skeg, and she turns into any wind. Hard chines; these help the rapid turning, it carves around on the chines, the secondary stability and feel of the boat for edging are also unsurpassed. Low rear deck; very easy to roll. Low foredeck; good for the greenland paddle with its thumb skinning action on most boats. Ocean cockpit; once you get used to them the ocean cockpit is so comfortable and snug. O.K., it takes some practice to get in and out on the water, but the advantages of the; ease of use and comfort off the water of an ocean spraydeck, the proximity of charts and deck elastics, and edging/rolling control by knee bumps; out weigh any disadvantages by far. Comfort; the moulded glassfibre seat, slightly tilted back, is superior to soggy padded seats. There is no real need for a backrest, but the modern Valley system does give lumbar support if you need it. The ocean cockpit and low decks encourage a relaxed, straight legged posture. Size; this boat was designed for the 1960s UK citizen, since then the average man and women has grown by more than 5kg and an inch or so in height, young people much much more. Ladies average waist lines have spread from 27" to 34" and a 2011 size 12 bears little relation to a 1960s size 12. I find myself downsized from m to s on the clothes racks. So what was a boat for all is now a boat for the medium to small; 55-75kg and feet size 10 or smaller are the order of the day. As for myself, I am 67kg, 1.71m and size 8 feet, '1960's man', it is a perfect fit. Loading; this is not the boat to be loading with crates of beer for your week away. The front hatch will hold 4x 5l dry bags plus oddments in the bow and v bottom and the rear 4x 5l or 2x 12l plus tent etc along and behind the skeg. The day hatch either a couple of 5l drybags or a weeks food and a couple of days water. I have packed it with all the necessary expedition kit, 10 days supplies and trolley; but I come from a lightweight mountaineering background. Having said that, a big boat in which you can load the kitchen sink is fine on the water, but what are you going to do when forced to land on a rocky shore with your one companion, if it takes 4-6 people to lift it? Hatch covers; the Valley hatch covers fit very positively and are equally difficult to put on and off Summer or Winter, they seal well. Kayaksport more flexible ones can be very stiff in cold weather. 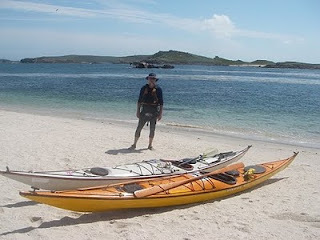 Kayaksport seem to last longer, used several times a week, the lifespan of the Valley ones is about 5 years. Replacements are readily available. Beauty; which boat can surpass the Anas acuta for sheer good looks? You will be spending a lot of time looking at your foredeck as you paddle along, or watching anxiously over the boat at lunch as the rising tide laps upwards. There is a lot to be said for an attractive boat.